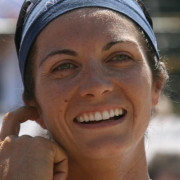 Olympic legend Misty May-Treanor is already known as one of the world's most famous beach volleyball players. Now she is receiving an honor that recognizes her amazing accomplishments. The USA Volleyball Hall of Fame is denoting May-Treanor as an All-Time Great Female Beach Player. She will get the award at their official induction ceremony in Columbus, Ohio on May 22. Two others will receive the Harold T. Friermood "Frier" Award and the All-Time Great Male Beach Player. The event will serve as a culmination of a career for May-Treanor that truly brought beach volleyball a greater spotlight. May-Treanor teamed with Kerri Walsh-Jennings to collect 104 international victories, the second-most all-time, male or female. They won 21 straight matches in Olympic tournament play and collected three gold medals. May-Treanor and Walsh-Jennings also won the FIVB Beach Volleyball World Championships on three times. She retired from competition in 2012 and remains active in the sport as the Director of Volleyball at Long Beach City College. May-Treanor was originally an indoor volleyball player and a two-time All-American at Long Beach State. She led the 49ers to a Division 1 NCAA Championship in 1998 and was named the tournament's Most Outstanding Player. To inquire about Misty May-Treanor's speaking fees and appearance costs, contact the agents at Athlete Speakers by calling us at 800-916-6008 or by Starting Your Booking Request Now.